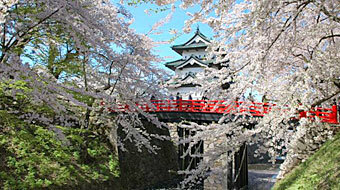 Near Hirosaki, there are also gardens and stores which trace the castle town. Sho-Arashiyama, which is famous for the Maple tree which the lord of the feudal caln brought from Kyoto, can be seen. Rice Paddy Art in the Tsugaru plain which is famous as a rice producing area. Ample contents including the “Tsugaru cuisine heritage Kenojiru”course. This first started with the design of Mount Iwaki drawn in the 5th year of Heisei along with the letters “Inabunka no murai nakadate”. 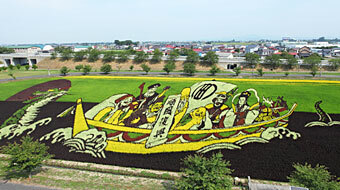 From “Monalisa” drawn in the 15th year of Heisei, it is called Rice Paddy art since then. Nowadays the promotion grade rice Tsugaru Roman and ancient purple and yellow rice, new rice of Iwai Akane is colorfully used. During the 4 months until the rice harvesting, 100 thousand to 200 thousand people come to visit. From the toppest floor of the village office Inaka kan “Inaka-kan jyotenshu”you can have a view. (Government designated historic site) It is a representative japanese garden of Oishi Bigaku Ryu Karesansui kaiyu-shiki. The garden covers 1.2 ha of land. The construction started in the 35th year of Meiji and was completed in 44th year of Meiji. 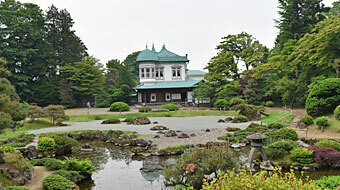 The building of semi western style with it’s unique beauty harmonizes with the garden and conceals the appearance of the Meiji period. Seibiyen became a motif for the movie “Karigurashi no Arietti” one of the works of Studio Jiburi in 2010.
open hours / mid April to September / 9:00～17:00, October to mid November / 9:00～16:30, mid November to mid April / 10:00～15:00. It is a castle town of Tsugaru Kuroishi clan. 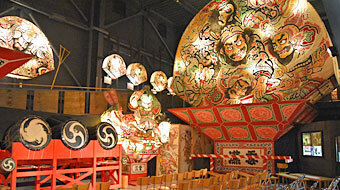 It features an arcade shopping area from the latter period of Edo era. 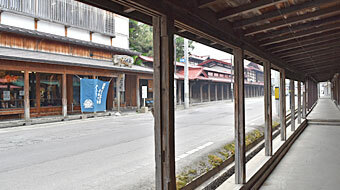 An arcade made of wood to protect the house from snow, there are a few still in Hirosaki and Tsugaru city, but the Komise in Nakamachi of Kuroishi city stays the same from the Edo period. It was chosen as one of the best 100 Japanese Roads in the 62nd year of Showa. In 1802 (2nd year of Kyowa) , Neishinkou of Tsugaru brought from Kyoto around 100 sorts of Maple seeds and planted them out. It became a beauty spot for the Maples. In the Nakano shrine in the forest, maples and momi fir of 200 years old, big japanese cedar (sugi) of 500 years old is raised. 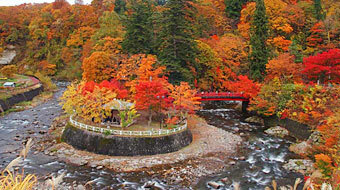 The autumn foliage with blazing red leaves shine brilliantly on the fall and stream. The beautiful view is praised. 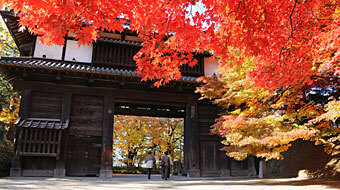 During the autumn foliage season, there is a lightup of the Momiji until the beginning of November. 3000 Kokeshi’s with 11types are gathered throughout Japan. 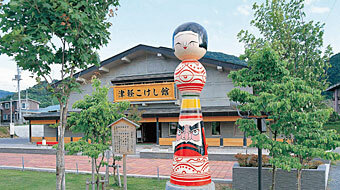 The best Jumbo Kokeshi and grain toys are also displayed. Mori Hidetaro from Nurumayu Onsen of Kuroishi city and Tatsuo Hasegawa from Ohwani have cultivated the tradition of Tsugaru type until today. Admission fee / Adults 320 yen, Highschool students 270 yen, Elementary and Junior Highschool students 160 yen.